Successfully Added 1 DIN Android Car DVD Player "Road Reaper" - 7 Inch Screen, GPS, WiFi, DVB-T to your Shopping Cart. 1 DIN Android Car DVD Player "Road Reaper" with a 7 Inch flip out screen, GPS, WiFi, and DVB-T is a great wholesale way to get the most of your car dashboard. Bring your dash board back to life with this ghoul of a DVD player called the “Road Reaper”, it will surely scare off any of the competition. 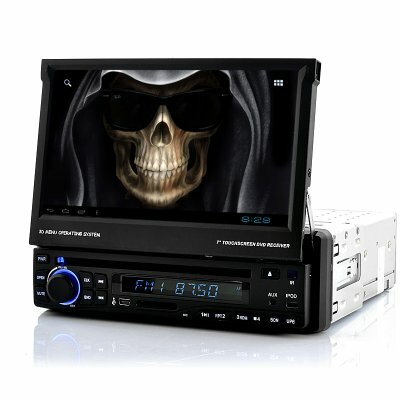 A one of a kind 1DIN Car DVD Player that runs Android 4.0 operating system, the “Road Reaper” truly takes car entertainment to the next level. Download and install any Android app directly to the Car DVD player over Wi-Fi b/g/n connection, surf the web or even watch movies on the large 7 inch flip-up screen. This “Road Reaper” single DIN 7 Inch Touch screen Car DVD Player features an impressive 800 x 480 pixel screen resolution to make disks and videos played on this outstanding system appear visually attractive. Watch MPEG-2 compressed DVB-T on its amazing screen as this car DVD has a strong DVB-T receiver antenna for crystal clear over the air free digital TV. The GPS will guarantee to advance your journey with Lane Assist, Voice Guidance, 3-D Views, Intelligent Route Planning, Points Of Interest (POI) and other useful GPS features. The “Road Reaper” can play the most popular video and audio file formats like MPEG 1/2, AVI, DIVX, XVID and MP3 with little burden. Attach an iPod or portable media player to the “Road Reaper” and have plug and play access to your entire media collection. Additionally, the “Road Reaper” has a convenient region free DVD disk player that can play DVD's from any continent. 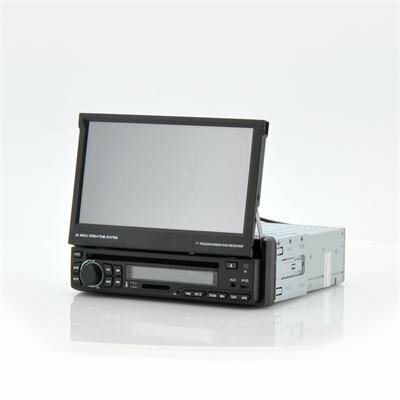 A huge advantage of this car DVD unit is that it requires less space than a standard 2 DIN unit, however due to have a flip out 7 inch screen; it still gives what you expect from a 2 DIN DVD player while saving on dash board space. Let this Android car DVD player that is packed with features bring your dash board to life . This product is in stock and can be dispatched within 24 hours of ordering with a 12 month warranty. Brought to you by the leaders in wholesale electronics and car DVD players, Chinavasion.